Summary : The aroma of this tea was excellent, but I found the flavor of the tea to be too "gingery" without any real flavor of cinnamon or other spices. There are better chai teas around than this one. Review : I'm not exactly why I found myself in the mood for a chai tea today. It's not because I don't adore chai teas...I absolutely do. But see...I'm suffering from sunburn, and a spicy, hot tea just didn't seem like the "perfect recipe" for a end of day cup of tea. Still, I'd been tempted recently to try some of the teas that came in the Stash India Collection tea sampler I recently bought. And as such, sunburn and all, I found the motivation to give this tea a try. Admittedly, I now approach all green teas from Stash with a bit of wariness...no doubt one reason I took a while to give this tea a try. This wariness is due to my experience with their awful green tea. Still, I live for today...and forget the past. So I worked up the nerve and gave the chai green tea a try. 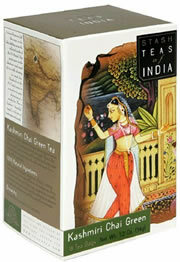 Here is how Stash describes this tea : "This is a true tea-stall chai, as lively and flavorful as the Srinagar bazaar." This tea contains the following ingredients : Indian Green Tea, Ginger, Cinnamon, Allspice, Nutmeg, Clove, Safflower and Natural Flavors of Cardamom, Clove, Cinnamon and Almond. Now my first impression of this tea was really positive. For better or for worse, I tend for form judgments of a tea due to its aroma. And in this case, the aroma was very nice...with a very spicy aroma about it. In short...the aroma said "Chai Tea" all over it. The flavor, however, was...well strange. I've never had a chai green tea like this before. Now...I'm not saying it was bad here. Just different...although for me at least...not necessarily different in a good way! In particular, I seemed to find the flavor of ginger way too strong in this tea...it seemed to sort of bury everything else in the tea. I normally like ginger in my tea...but here...well, let's just say it is a "ginger lovers delight." Overall, I was satisfied with this tea, but I can't really say many great things about it due to that overwhelming ginger flavor I found in it. I personally liked Stash's Chai Green Tea much better. Recommendation : Maybe. If you prefer your chai teas "less spicy" and "more gingery," then absolutely...this tea is for you. But if you are looking for a more traditional chai flavor...particularly of cinnamon or other spicy flavors...you won't really find it in this tea. Brewing Instructions : Pour 1 cup of boiling water over tea bag. Let brew 3-5 minutes.